SONOITA – Scammers are out there, ready to offer you a deal too good to be true, award lottery winnings for a contest you never signed up for, or even demand payment for a debt you didn’t realize you had. Officials with the Better Business Bureau said its latest tool, the BBB Scam Tracker, helps consumers spot tactics like these that fraudulent companies use to take advantage of people. The tracker allows the public to post complaints about strange phone calls they’ve received or misleading companies they have encountered. Barbara Post-Milo’s 93-year-old mother, who is almost completely blind and suffers from dementia, got caught up in a scam that cost the elderly Tucson resident more than $700. “One thing that she said, in their defense was, ‘but they were such nice young men,'” said Milo, who lives in Sonoita. The charming men were deceiving, Milo said, but that didn’t stop her from reaching out to Attorney General Mark Brnovich’s office, the Arizona Registrar of Contractors and the Better Business Bureau. Milo said that all the agencies acknowledged her complaint, but the state has taken no legal action. While the scammers already have cashed her mother’s check, Milo said it’s important to prevent other people from becoming victims. 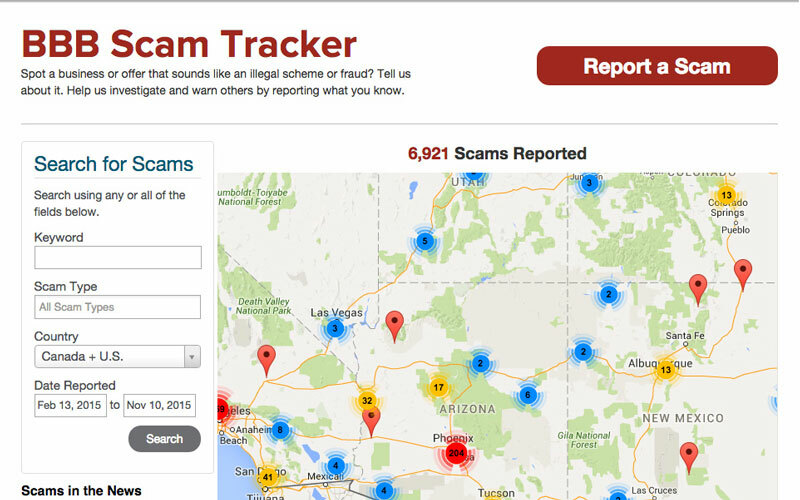 The Better Business Bureau launched the tool in Arizona in February, and users have submitted nearly 200 complaints within the Phoenix area. States across the nation utilize the tracker to help the public spot possible trends, according to the group. Felicia Thompson, the organization’s vice president of communications serving central, northern and western Arizona, said grammar errors or misspellings can be red flags for an illegitimate company. “The best way I think to fight scams or scam artists is the power of information and knowing what they’re saying and how they’re saying it to different target groups,” Thompson said. With the holidays near, the nonprofit organization’s officials said it’s crucial people take precautions and double check before sending a check to charities or other organizations.